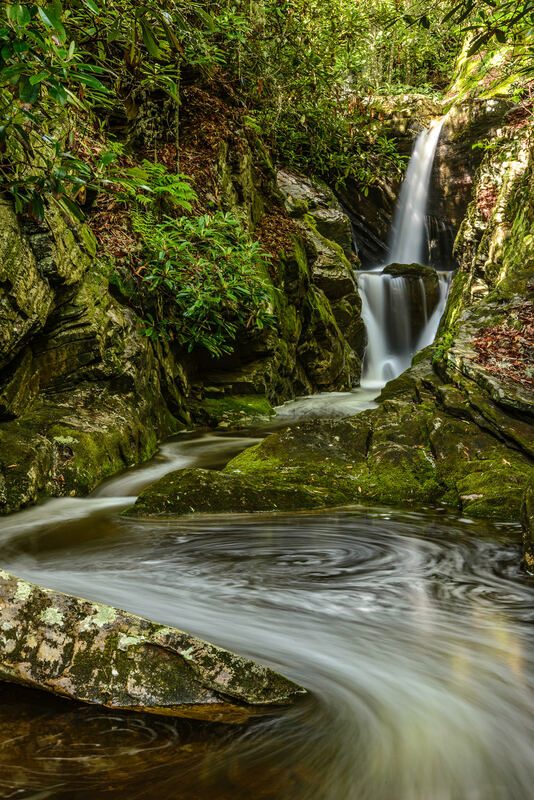 Directions: Hop on the Blue Ridge Parkway and head either north or south to the Linville Falls area at milepost 316.4. From Asheville, it's about 65-70 miles scenic miles north depending on where you got on, and you'll pass the Craggy Gardens, Mount Mitchell and Crabtree Falls areas. From Boone/Blowing Rock it's about 35-40 miles South and you'll pass Grandfather Mountain. Turn onto Linville Falls Road; go 1.5 miles and park at the visitor center where the hike starts. This shot was taken at 4:24pm. It is so covered with forest that anytime would be good to get this shot, maybe high noon would be best? We visited the Smokey Mountains in May to beat the crowds that happen after school lets out. It is a bit of a hike in but we carried our tripods knowing that we wanted to take long exposure shots. During the hike in a storm rolled in and we got drenched, luckily our gear was protected. Since I was already wet I walked into the stream and set up my tripod. While trying to compose I had a large crayfish walk up my leg, it kinda freaked me out when I saw what it was… I almost knocked over my tripod. Once I got him off of me I then had a large water bug crawl up my leg… but when I saw the image I made it was all worth it to me, I hope you like it. 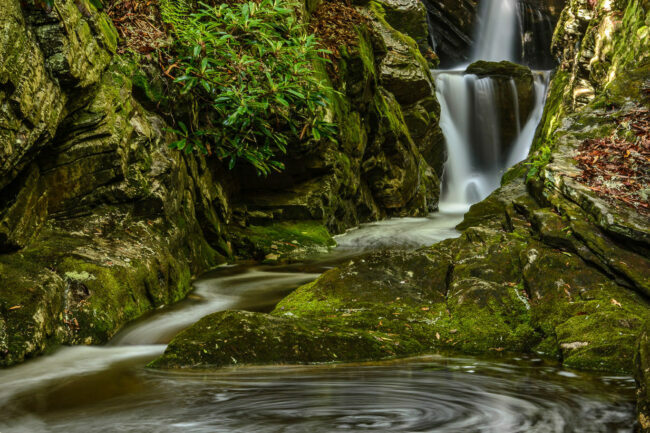 For great photography visit the Smoky’s and drive the Blue Ridge Parkway, stunning views and endless hiking await.